The best strategy for mobile marketers to drive incremental revenue from returning customers. Segments don’t drive your revenue, your users do. User-Based Retargeting helps advertisers generate incremental sales from each individual app user with a custom ad and a unique algorithmic bid as opposed to group optimizations on manually created segments. Most brands are still relying on outdated web-based targeting techniques that don’t leverage what in-app technology can do today. At best, users are grouped together based on 2–3 shared characteristics with bidding decisions and ad placements being generalized for each group. In segmented targeting, granularity comes at the cost of both optimization and scale, as it limits machine learning algorithms to only learn about segments, instead of individuals. If there is one thing incrementality and uplift tests have consistently shown is that addressing single users with unique ads shows more incremental conversions across an app’s overall usage than targeting groups with bidding or ad placement rules per segment. Why treat in-app users, for whom you have a wealth of individual contextual and behavioral data, as if they were web users for whom you only have limited browsing history, grouped by IP addresses? Cutting-edge predictive bidding, leveraging all in-app data points to make bidding decisions for each user. Personalized ad-placements optimized in real time by machine learning algorithms that learn about individual users. Imagine if instead of splitting users into a few segments… you could simply have each user be their own unique segment. Say hello to User-Based Retargeting! Not all users are created equal, or respond equally to ads. With User-Based Retargeting, our platform assesses the “retargeting value” of each placement in front of each individual, to determine the most efficient bid value for maximum ROI. The behavioral data we receive from our customers is combined with contextual data we collect from the open market. The algorithm uses this to predict the best bid price for unique placements, as well as their overall worth to generate incremental conversions for the advertised app, minimizing cannibalization. Granularity drives Scale — counter intuitive, yet true. With User-Based Retargeting, higher volume is achieved, with roughly the same CPA. 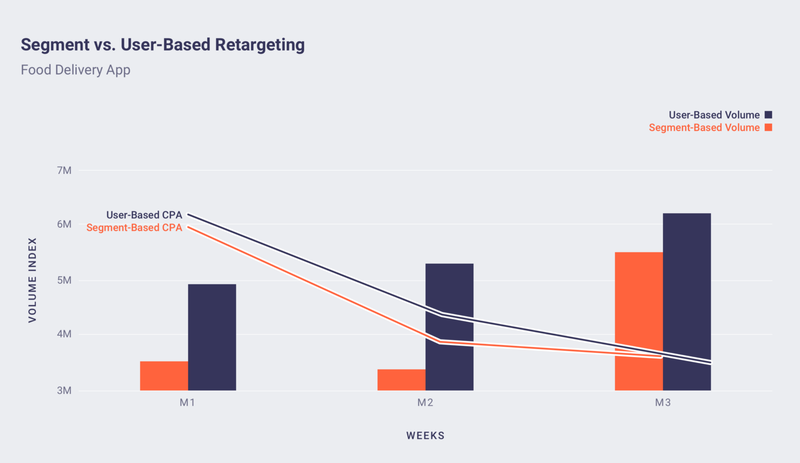 Revising the same campaign data by week rather than by month, we can see that CPA for traditional Segment-Based Retargeting is a lot more volatile. Having higher reach, User-Based Retargeting allows advertisers to optimize upon more data points, making the whole decision-making process more efficient and ensuring a volume-performance relationship that is stable over time. User-Based Retargeting is machine learning at its best. It combines both contextual and behavioral data signals, actively analyzing and refining the bidding engine. Influential Contextual and Behavioral variables are identified: During the initial exploration phase our platform efficiently compares 100s of relevant variables, such as Device Model, Placement, Location (contextual) and Time Delta Amid Events and past purchases (Behavioral). The more data points the machine learning algorithms analyze, the more accuracy our platform will achieve. Our Programmatic Platform Optimizes for Performance: After the exploration phase, our platform efficiently calculates how much it should bid for each user and what creative to serve to drive the desired in-app actions. Our algorithms don’t follow a winner take all logic, so it never stops testing and learning, it does however use those learnings to efficiently allocate spend. We Leverage Learnings to Scale: Once our algorithms identify the best performing variables, our platform will increase the volume while maintaining the achieved CPA. It’s time to cater to users. Focusing on a single segment can be just as bad as focusing on too many. The smaller the user base you are targeting, the less data points that are available to feed into the platform. Less data points translate into less efficient optimizations, which in turn, makes the campaign more costly in terms of time and money invested to get better results. User-Based Retargeting is the solution. A strategy which simultaneously enables granularity and scale. Personalized creative and bidding decisions maximize cost-efficiency and improves the overall user experience with hyper relevant ads. For more information on how our User-Based Retargeting products works and how it can help drive incremental revenue for your brand, contact us here.